I have been hooked on these since a visit to Ireland in 1986. Some people remember the beer, I remember the candy…..
You can tell that these are English candies just by the name “Gums”. Here in the states we Yanks would call them chews, or something, because these are not gum. 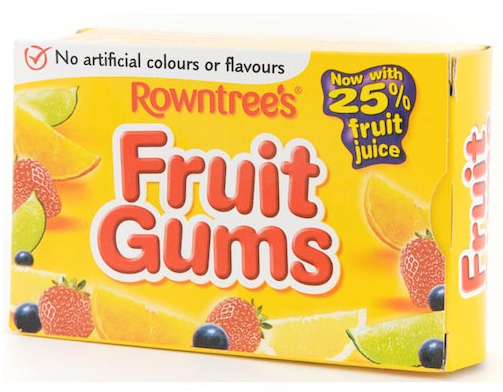 What do the English call gum?….anyway, these are tasty, little, chewy candies flavored with fruit. According to the company web site these were created in 1893, which makes them one of the oldest candies made by Nestle. You can’t find these in your average grocery store (unless you live in Cambridge, MA). I buy them at World Market, an excellent purveyor of imported candy. You will find them in a little yellow box, or yellow roll, or if you’re really lucky, a yellow bag. The ones in the box are shaped like fruits. the purple ones are black current and are the best in my opinion. These are not soft chews, and they will stick to your teeth (but it’s worth it). What DO the English call gum? I’m English. We call “gum” chewing gum or bubble gum. “Gums” in the plural usually means chewy fruit candy. We say “sweets” or “sweeties” as a general word for candy. The word “candy” is very specific in England – usually refers to hard fruit candy, like boiled sweets. PS: Fruit gums are my favourite. I have a tube a week. They are made with real fruit juice, with nothing artificial and are quite low in calories for sweets, so I don’t feel too guilty. Wow, thanks Petra. The English have superior sweets to those found in the states and that may explain why there are so many different words for what just call candy. Fruit gums are my favorite, too. I’d eat at least a roll a week if I could find them in the stores. Thanks again for your comment.